With the proliferation of smartphones and PDAs, wristwatches have been relegated to fashion statements, seemingly going the way of the pocket watch. But if you’ve lost or misplaced your glowing rectangle, just look around. Clocks are everywhere, ready to help you schedule your day, and many of them transcend that intended practicality. They’re essential and beautiful enough to warrant museums throughout the world, from Pennsylvania to Mexico City (the Clockmakers’ Museum in London, the world’s oldest museum dedicated to instruments of time, is particularly interesting). You don’t have to be a horologist to appreciate their beauty and engineering finesse; you simply have to appreciate art. These are my favorites. Every visitor to Venice eventually finds himself or herself in the Piazza San Marco. You’ll see them on impossibly long queues at the Basilica di San Marco, the Doge’s Palazzo, and the Museo Correr. They’ll patiently wait their turn to ascend the Campanile as they pose as scarecrows on which countless pigeons alight. 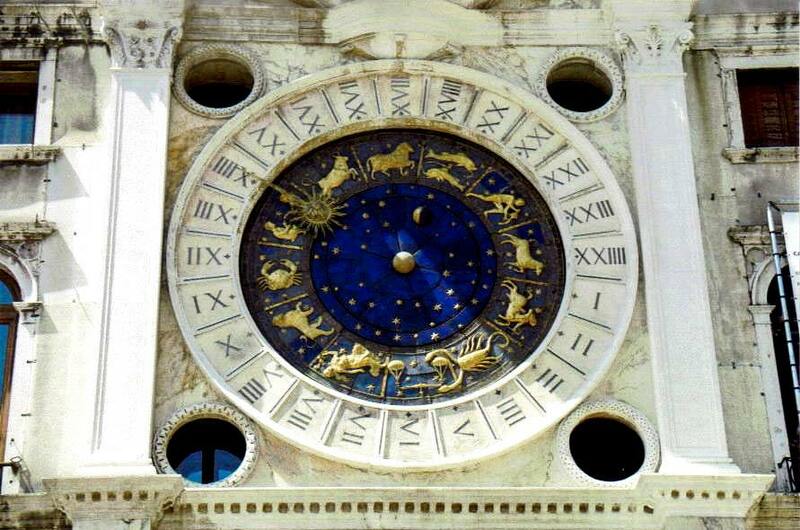 And more than a few of them, like me, look up to admire the Torre dell’Orologio and the gorgeous St. Mark’s Clock. Originally unveiled in 1499, the clock has been rebuilt and restored a few times over the centuries, but this mechanical marvel still retains its grandeur from more than 500 years ago. Framed by two Corinthian pilasters above an arch that leads to a main shopping street, the circular clock face flashes a burst of cobalt blue against the white building. Twelve golden zodiac signs ring around the central disc, which has the earth in the center, a rotating moon to represent its various phases, and a smattering of gilded stars. Around that, a fixed marble circle inscribed with Roman numerals, from I to XXIIII, indicate the hours of the day, with the I positioned at around 3:30. Above it, a digital clock, added in 1857, displays the hour in Roman numerals to the left of a statue of the Virgin and Child in a niche, and the minutes in Arabic numerals in five-minute intervals to the right. Twice a year, on the Epiphany and the Feast of the Ascension, the numerals are lifted to make way for a procession of Magi figures that sweeps around Mary and Jesus. 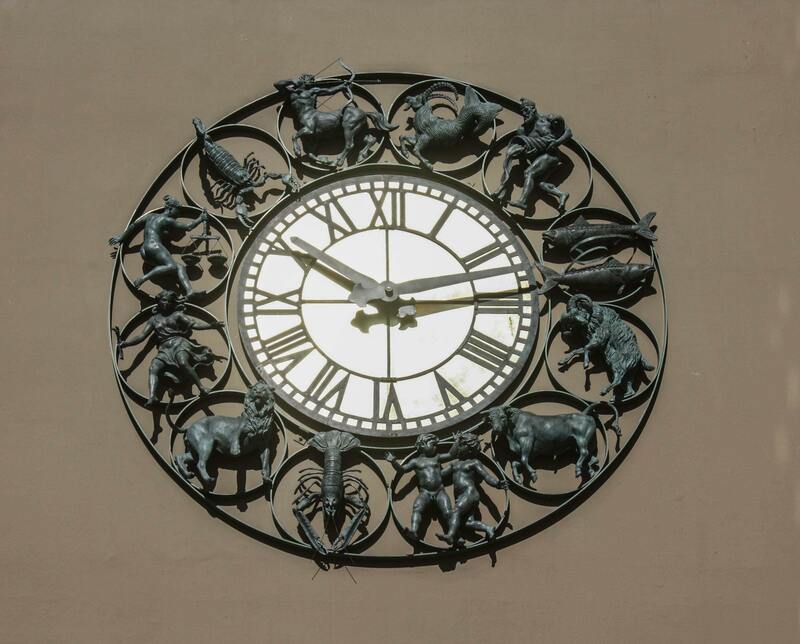 When I stepped out of Central Station in Norway’s capital, one of the first things I spied was the gleaming Oslo Astrological Clock attached a couple of stories up the side of a building. With a diameter of more than 11 feet and weighing in at about 2,200 lbs., the clock features a fairly simple face, with Roman numerals and 22-carat gold-leaf tiles. Surrounding it, however, is the clock’s mark of distinction: 12 signs of the zodiac, cast in bronze and painted, each centered in and spilling a bit over their individual copper rings. Details like the ripples in Cancer’s shell or the folds in Virgo’s robe become more apparent the longer you stare at it, unaware of the time now passing right before your eyes. Designed over the course of more than a year by two Norwegian artists (one created the human astrological figures, such as Aquarius and Libra, the other created the animal characters, like Taurus and Scorpio), the clock was unveiled in 2010 at a ceremony hosted by the mayor of Oslo and attended by some of Norway’s foremost astrologers. How many? Twelve. By far the most unusual clock I’ve ever seen, the Scottish-made Millennium Clock looks like something out of a Dr. Seuss tale — at least at first glance. 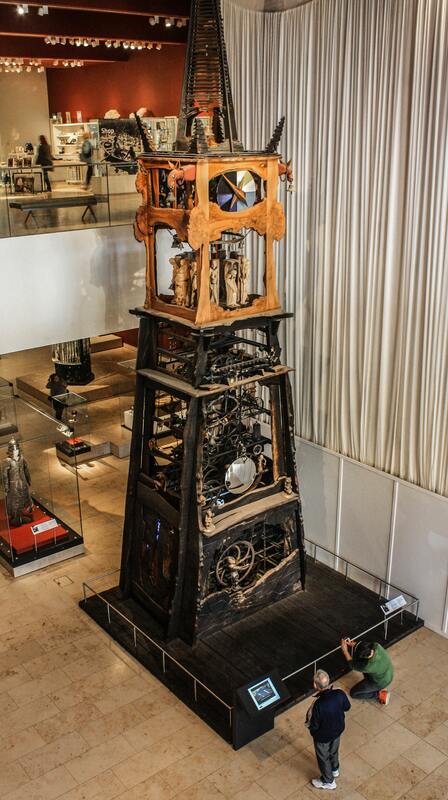 Constructed of wood, glass, and metal, the clock features a bewildering array of chains, wheels, gears, bells, and figures, an engineering achievement that truly astounded me. A closer look, however, reveals that the Seuss tale has gone terribly awry. Commissioned to mark the beginning of the new millennium in 2000 and its future promise, the clock also looks back at some of humanity’s ignoble moments. Inspired by the form of a medieval cathedral, the clock’s makers — including a furniture maker, a glass artist, and an illustrator — divided the 33-foot-tall clock into four sections: the Crypt, the Nave, the Belfry, and the Spire, each with its own messages. In the Crypt, for instance, a grinning Egyptian monkey seems to turn the clock’s mechanism. In the Nave, a skeleton rides the pendulum with a convex mirror; if it were a foot or two lower, you’d be able to see the reflection of yourself watching time fly. Figures of Hitler, Lenin, and Stalin overtly remind you that the good old days weren’t always good; more subtly, a Charlie Chaplin lookalike will make you look beyond his comic persona to the serious issues addressed in his films, like the Great Depression and totalitarian states. Above that, in the Belfry, a circle of 12 figures representing the months of the calendar do not take the form of, say, a nymph for June or an elderly man for December, but rather of degraded humans subjected to the ignominy of war, famine, slavery, and persecution, from a woman in labor giving birth to a demon to a man in chains with a Star of David around his neck. At the top of the Spire, a female figure carrying a dead man — a pietà — provides a glimmer of hope. Through pity and compassion for what has preceded us, we have the strength to carry on. Speaking of carrying on, while keeping calm, Big Ben has been a stalwart source of courage that epitomizes the rallying cry of that famous 1939 motivational poster. 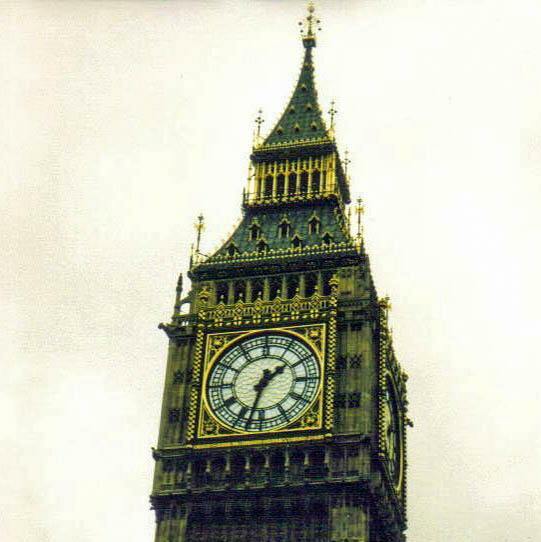 Technically just the great bell of the clock, “Big Ben” is the nickname many people use to describe the entire clock tower (officially rechristened the Elizabeth Tower in 2012) of the Palace of Westminster in the heart of London. For about 150 years, it has survived some tough times in its hometown, and I don’t mean just the fallout of Brexit, all while maintaining a dignified aesthetic. 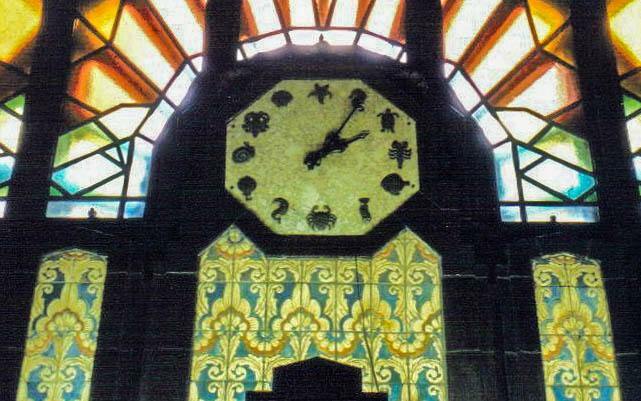 The four identical clocks on each side of the tower bear a 14-foot-long minute hand and a nine-foot-long hour hand that sweep across a face of 312 pieces of opal glass that resembles a stained-glass window. The Roman numerals deviate from other clocks that use the same figures, with “IV” and “IX” replacing the more standard “IIII” and “VIIII.” The faces are surrounded by fine gilding, including letters at the bottom that spell out “DOMINE SALVAM FAC REGINAM NOSTRAM VICTORIAM PRIMAM,” Latin for “O Lord, keep safe our Queen Victoria the First.” Always illuminated at night (except during World War I, to avoid guiding German zeppelins, and during World War II, to again avoid attacking Germans) the clocks serve as a handy visual reference point for disoriented visitors. It’s also a beacon for locals, keeping Londoners on time with enviable accuracy — except, for instance, in 1949, when a flock of starlings perched on the minute hand, slowing it by four minutes and 30 seconds, and on December 31, 1962, when heavy snow and ice on the minute hands caused the pendulum to detach from the clockwork, as it was designed to do in the event of unusual stress, thus ringing in the new year at 12:10. Children just learning to tell time may not benefit greatly from the clock inside the Marine Building. “When the little hand is on the lobster and the big hand is on the starfish,” their parents might say, “it’s three o’clock.” Once you’ve mastered an analog clock, however, this one’s a pure delight. When the Marine Building opened in all its Art Deco glory in 1930, it had topped out at 22 stories and 321 feet — the tallest building in the entire British Empire. The exterior terra cotta sculptures and carvings drip with a captivating marine motif, from a pufferfish and a flock of seagulls to anchors and seaweed. Through the soaring portal, one of the world’s most magnificent entrances, I entered the lobby into a stylish wonderland. The elaborate ceiling looks like it was pilfered from a Mayan temple; plaster sails and prows of ships protrude from the walls near the ceiling; all sorts of sea creatures on the walls, elevator doors, and floor await discovery. But it wasn’t until I had explored the whole place and was on my way out that I noticed this terrific clock above the doors. Marine life replace the numbers for the hours — a seahorse for one, for instance, a turtle for two, a crab for six, a snail for nine. Although you’ll want to loiter around the lobby, even after you’ve taken in all its charms, the clock reminds you that it’s time to move on — but it does so in the cheeriest way possible.